Now I know a lot of us ladies have a notion of what our jobs would be should we ever become a bridesmaid for a sister, sister-in-law or a friend. My thought is that we are essentially at their beck-and-call, right? WRONG. 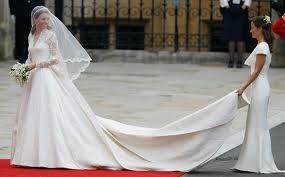 Back in the old days, bridesmaids were to wear a dress similar to that of the bride, just as Pippa did. Although I'm sure she did it for a different reason, but the purpose of the bridesmaids wearing a similar dress to that of the bride so that on their group stroll into the church, they would distract and ex-lovers or ill-spirited attendees from actually figuring out which one was the bride! (This can be compared, too, to the men in their penguin suits). So ladies, that dress you think you'll never wear again ACTUALLY does come in handy. The facts you have shared about bridesmaids in a wedding are just awesome dear. I never thought of it, that it can also be a possible reason behind it. Well, I am looking for Los angeles wedding venues for my big day. Do you have any suggestion for me?